I love the theme for this month's Imagination Crafts projects: PARIS. One of my very favourite places on earth. And here are all the closeups. I used a piece of broken fencing for the shelf, and decoupaged the rice paper flowers, bird and butterflies onto text weight paper using Imagination Crafts Decoupage Plus (glue under and on top of the rice paper for a great finish). Once I'd fussy cut, I was able to mold these with my fingers to create a curve before gluing down with glue gel. The words are Magi Kutz, which is a fine velvet finish board that you can colour - or not. I painted with Starlights paint in Pink Sunset. The dress model and perfume bottle were stamped onto heatproof acetate and embossed, then fussy cut. I added colour on the back of the acetate using more Starlights paint, and added sparkle to the perfume bottle top and bulb with Sparkle Medium in Gold Shine. 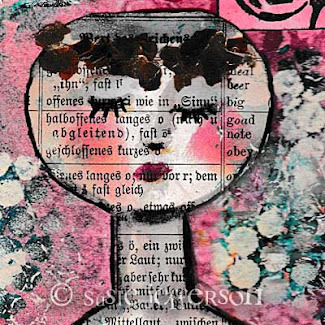 The background is a stencil - the top section is Dorla Perla dimensional paste in Perla, on pearlised card. The bottom section is white on white, with the same stencil and gesso, used over the entire canvas. Edges are a finger-ful of Shabby Chic Relief Paste in Sage, with highlights of Finger Wax in Inca Gold. 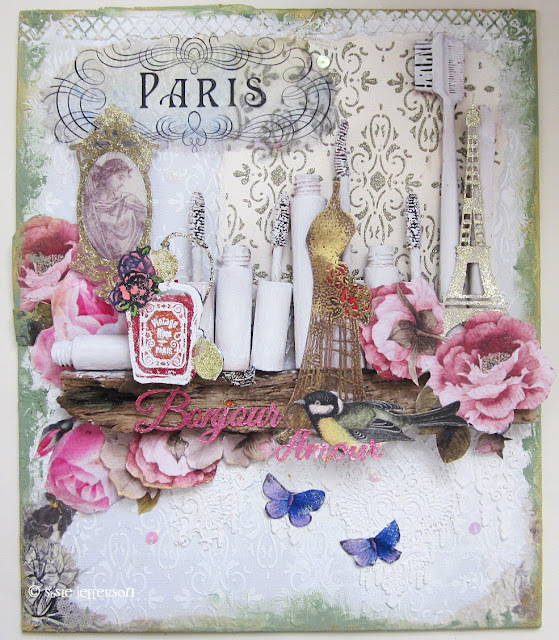 The Paris title was torn out of the rice paper, using the same decoupage glue to apply it onto the canvas and also over the background paper I created. The Eiffel Tower is another piece of Magi Kutz, just gessoed. The frame is also Magi Kutz, with the rice paper image added behind to create a portrait effect. Now - the mascara wands etc - I know you want to know about them, lol. These are samples you get every time you buy some makeup products, and something I can't bear to throw away but also never seem to use - so I gessoed the lot, and glued them onto the shelf with glue gel, then placed the rest of my prepped arty bits once thoroughly dry (and shaken to make sure things weren't going to come off). I can't tell you how much fun I had creating this! WOW Susie what an awesome canvas! I love it!